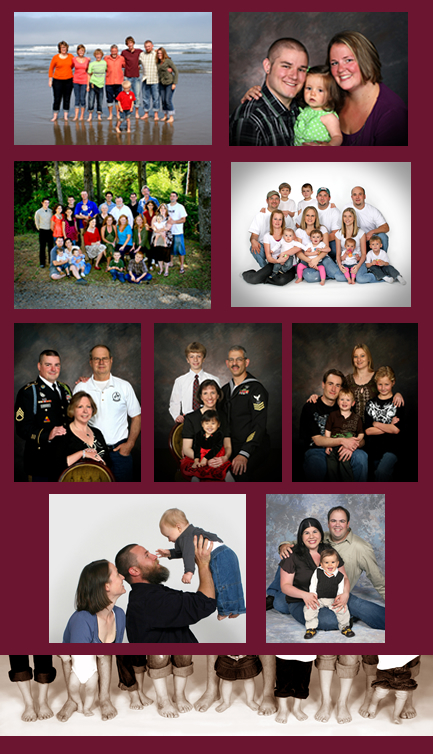 Our studio is probably best known for providing families with the finest in family portraiture for many years. Whether in the studio, your home or at one of our beautiful beach locations, we will create a portrait of your family that you will be proud to display. Family sittings are sometimes difficult to schedule because of busy family activities. We try to help by accommodating their schedules by offering weekend and evening appointments. Don't let those special times with your family slip by before your children leave home for school or other commitments. Let us make your family reunion one to remember with a treasured photograph of you and your loved ones. Call us today to make one of the most important appointments that you will make. We will answer any questions about making your photographic session a very special one.